Engineering Capabilities — Intelligent Systems Research, Inc.
System EngineeringIntelligent Systems Research's extensive development background and system engineering processes lead the way in providing the best of solutions to the challenges we face in defense system development. Intelligent Systems Research engineering team’s background in system engineering includes extensive requirements, architecture, interface and performance analysis efforts on many critical development projects including the Patriot Missile System, THAAD BM/C3I, MEADS BM/C4I, SDI GBR-X, TMD GBR / THAAD Radar, the Hubble Space Telescope Control System, TSQ-73, Light TACFIRE, Navy E-2Upgrade, the Comanche Helicopter, and the Joint Strike Fighter as well as several other weapon and control system developments, including the development of thousands of detailed system and software requirements for those systems. Most recently, Intelligent Systems Research developed the US Army’s Integrated Air and Missile Defense functional requirements for Increment 1.5 in 2005, developed the requirements and much of the software component architecture of the Joint Track Manager as part of the Joint Architecture Working Group and then developed the detailed system architecture definition for the IAMD Increment 2 (see below). 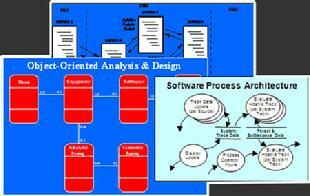 Our team’s background also included the first large system software development for a weapon system battle management using object-oriented analysis and design methodologies in the early 1990s, which futher led to methodological advances that helped lead the industry to the development of the UML approach. The engineering team at Intelligent Systems Research leads the way in the development of the most advanced distributed system architectures. Our team members were the core engineering team that successfully designed and developed the netted, distributed, replicated (net-centric) architecture of the THAAD BM/C3I in the Dem/Val phase of the program during the 1990s. Most recently, Intelligent Systems Research led the development of the US Army’s new architectural approach for the Integrated Air and Missile Defense (IAMD) Battle Command System project (first documented in the IAMD Architecture / Capabilities Definition Report in May 2006). This architecture explains the methods by which air and missile defense sensor and weapon components (Patriot, SLAMRAAM, JLENS, and THAAD) are integrated into a system of systems architecture enabling engagement of air, cruise missile and ballistic missile targets using available sensor / weapon combinations. Intelligent Systems Research modeling & simulation and algorithm / software technology development capabilities are unique in the industry, having developed among the most sophisticated algorithmic software technologies in the defense industry. Led by our chief scientist and world-class physicist, Dr. Phillip Dennis, our research and development process has been used extensively by our staff while supporting defense programs as members of large research and development efforts. This disciplined methodology divides the analysis phases of the research into well-defined steps wherein appropriate metrics are examined and used for assessing progress, identifying technical problems, establishing completion criteria, and developing products at each step. Our comprehensive approach includes the prototyping, integration and testing of each algorithm component on target platforms in our algorithm test bed. Intelligent Systems Research’s engineering team has extensive system software design and development experience that includes development of large, complex, real-time software systems for air and missile defense battle management, radar control and missile guidance software. Intelligent Systems Research’s engineering team led the first large system software development for a weapon system battle management using object-oriented analysis and design methodologies in the early 1990s, which led to further methodological advances that in turn led to the development of the UML approach. Our software development efforts are focused on ensuring our software meets all performance requirements to support component-based open software architectures, while developing our software to the highest standards of quality, modern development methodologies and consistent development process and to support all program cost and schedule objectives.